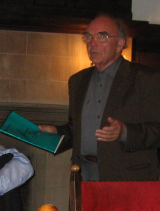 Dr. Horst Kummer, one of the CCSDS co-founders, has passed away on 11th April 2015, aged 85 years. He was the leader from the European site, co-ordinating the development of data/communications technology and standards that enable multinational missions ensuring cross-support interoperability. Dr. Kummer was the first CCSDS Panel 1 Chair, and later the CCSDS TSG (Technical Steering Group) chair, which was equivalent to the current CESG (CCSDS Engineering Steering Group). He is credited as one of the inventors of the TM / TC packet standards. Dr. Kummer will be remembered not only due to his technical and managerial skills, but also as the CCSDS European co-ordinator and strong consensus enabler within the CCSDS organization.